Some of my all time favourite T-shirts come from Primark. Made in Romania or Poland these cotton with Lycra T-shirts are a tight fit (which I like), wash and wash without shrinkage or piling. Normally £2-£3 each, they come in a wide range of styles and colours – sleeveless, long sleeves, vests, V necks, and so on. I like a striped T-shirt and they usually have a good selection. I would also recommend kids T-shirts great too, and if you hand decorate them they make unique presents. When i am want a quick project I like printing on, or painting, a ready-made T-shirt rather than printing on fabric and then making it up. 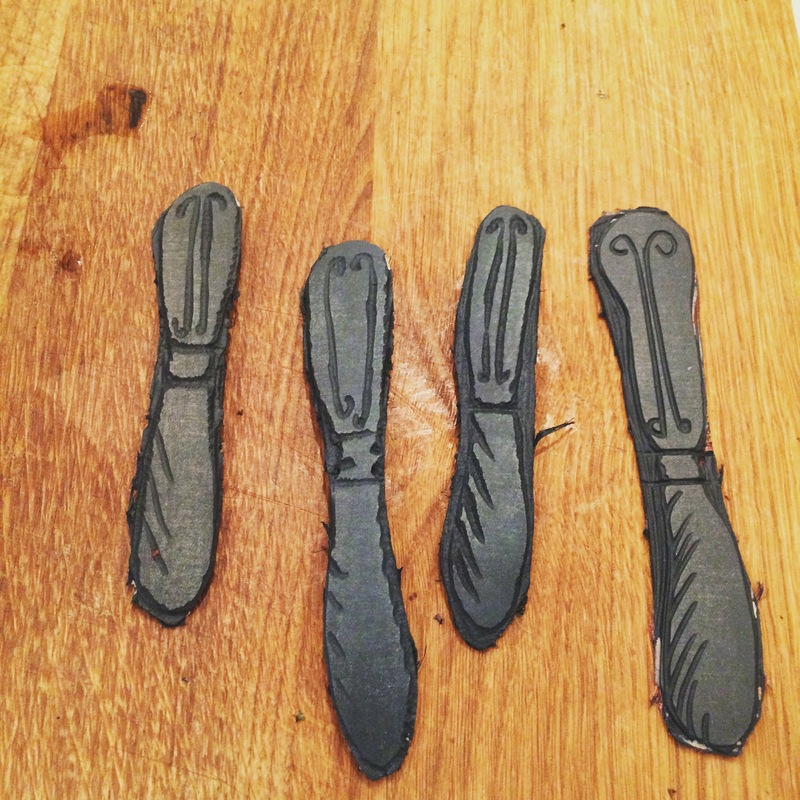 Instant gratification (it takes about half an hour if you have the lino prints already made) Here are my four knives I quickly cut from small offcuts of lino. Rather than using a whole block for a specific picture, small elements can be used to build up a pattern. I had a really simple arrangement in mind with this T-shirt print. 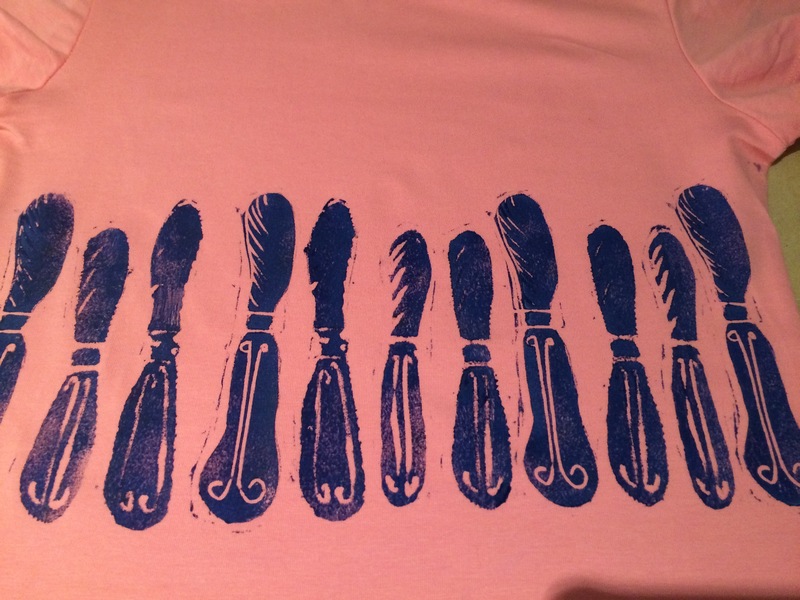 I used navy printing ink of a pink T-shirt, and arranged the knives right across the chest. I didn’t mind the “shadow” effect around the knives, but if you do then you can trim them more severely. You may remember that I meant to make a hand painted silk dress to take on my holiday, but time ran away with me. The new government in the UK and its desire to rewrite Housing Policy is creating quite a lot of controversy and change, so I had been very involved in that right up until our holiday last week. In the end I just had the one the hand-printed T as my only new item. In the photograph below I have it on with a navy linen skirt made from Vogue 1247. The inelegant grey bobby socks plus trainers look a bit mad, I know. 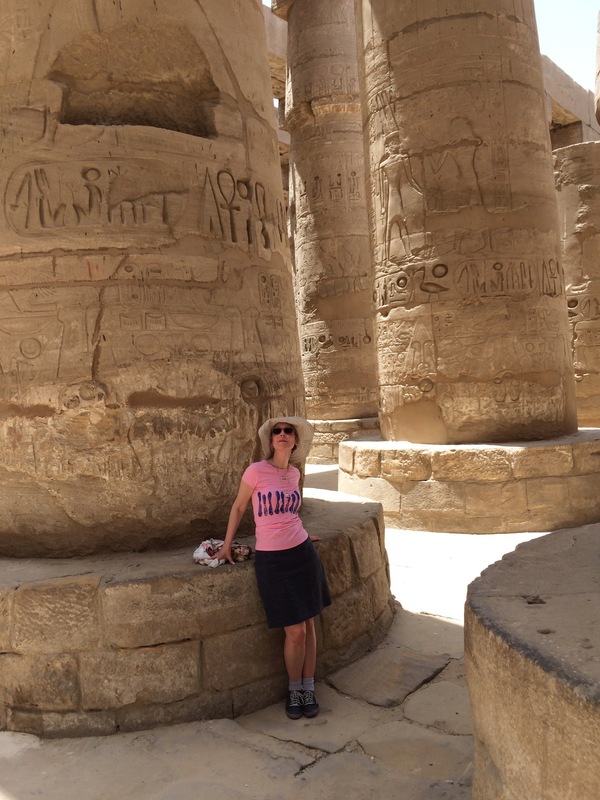 I am nonchalently leaning on one of the amazing columns at Karnak Temple, near Luxor. Being in Egypt, and seeing ancient rock carvings everywhere, i got lots of inspiration for carving into lino in order to make more printing blocks. I’ll show you some more pictures in due course. I haven’t bought those tees for a few years now but I remember buying a white and black version and being really impressed with the quality. I think the socks look cute in the shot, and naturally while on holiday, you’ll be walking lots with sight seeing……Egypt – wow!… Oh you are gonna come home with all kinds of ideas! Ha, I also love the knife print, super cute. Hope you are having a blast…moe pics please! Ps, is there a story behind your necklaces? Interestingly, yes. Like my pin cushions – one from my mother (the elephant), one from my husband – the Alex Munroe bee, and one I bought for myself at the Knitting and Stitching exhibition at Alexander Palace, cast in silver from a sea shell. Hmm. I obviously like threes. And treasuring gifts from my nearest and dearest! My husband is a bit of an artist. Perhaps this is how I can involve in my sewing.